Campeggio Le Cormoran si trova a Ravenoville, Manica, è situato vicino al mare. Questo campeggio dispone di piazzole delimitate, senza ombra e piazzole poco ombreggiate. Camping Le Cormoran si trova nei pressi di una spiaggia di sabbia. È possibile affittare casemobili e bungalow. Il campeggio dispone di un parco giochi e di un campo sportivo. Per gli sportivi, il campeggio prevede diversi percorsi in bicicletta. Ci sono un programma di animazione e uno spazio fitness. Per chi desidera rilassarsi dopo una giornata intensa ci sono sauna, idromassaggio e beauty center. Il campeggio dispone di una piscina scoperta, una piscina coperta riscaldata e una vasca per i più piccoli. Nelle immediate vicinanze potete fare il bagno in mare. Al campeggio Camping Le Cormoran è possibile praticare snorkeling, windsurf e sci d'acqua. Non è sempre necessario cucinare, perché all’interno del campeggio ci sono snackbar e pizzeria presente. In campeggio è possibile acquistare pane fresco. Potete navigare su Internet, poiché il campeggio dispone di uno o più computer con collegamento a Internet e nell'80% del campeggio potete navigare con il vostro portatile. Ogni anno un ispettore visita il Campeggio Le Cormoran, controllando oltre 200 tra attrezzature e altri punti di interesse del campeggio. L'ispettore è un dipendente ACSI e non lavora per il campeggio. stayed over on the way back to Cherbourg a lovely campsite right on the beach, a little quite around the area ie shops etc but handy to all the dday features along the coast , stayed on 11/12 june and fairly quiet on site heavy rain some days before and some pitches waterlogged but soon dried out, helpful English speaking staff 1st class toilets and shower block / washing up facilities with red hot water, large pitches with good degree of privacy, nice site. A large site right on Omaha beach and not too far from Utah and Juno. Good sized pitches and excellent shower facilities. The receptionist gets confused with pitch numbers and who\'s where. It took a lot of walking around the large site (cant take car through until you have your pitch sorted) before we found that the pitch allocated to us had already been taken then we had to find an alternative. Not what you want after a long drive. Once settled though we were happy with the site. Lovely to be able to walk onto the beach. I would happily recommend Le Cormoran just hope the receptionist can sort out the pitches. This site was very busy when we arrived as it was the weekend before the D Day Landing celebrations. The staff were very friendly and very helpful. The pitches were very spacious and very easy to get on and off. They were divided into groups of 4 or 5 pitches which made them peaceful and private. The facilities were clean and were maintained regularly. The site was full and there was sometimes a queue for the showers, but they were plentiful and there was more than one block so you could have tried elsewhere as opposed to waiting. The staff spoke good English (and other languages). Amazing site. Right on the beach. We have been visiting this site for many many years and it has developed into a great facility. Near to Normandy landings. Close to Cherbourg. Right on the beach . Perfect for kids as has a farm horse riding and lots of activities. Stayed here so that we would have a dog friendly beach near by, great beach, good dog friendly site. Facilities nice and clean with plenty of hot water. Nice large pitches some have their own private facilities if required. Good stop if travelling from Brittany to Normandy. Site gates are supposed to close at 11pm and open at 7am, but travelling workers seemed to manage to get in and out after 11 and before 5.30 which can be annoying. Nice well located campsite, in close proximity to Utah Beach, St Mere Eglise and other WWII places of interest. Large camping pitches, small farm for kids, baby play area, games room, nice indoor heated pool and two outdoor pools, 1 small waterslide. The bar only opened for 2½ hours each evening, from 5pm to 7.30pm - not too convenient. Shop on site that opens for a few hours in the morning and a few hours in the evening, lots of Fresh bread but get down early if you want croissants as they sell out fast. Prices reasonable. Fast food available from 6pm to 8pm Pizza's and French fries only - Pizza's are delicious but the French Fries were not very nice. Not too much walking distance from the campsite - we found it a nice relaxing stop on the way back to our ferry in Cherbourg. Super campsite, helpful English speaking staff, big pitches many fully serviced. Cars can be hired on the site which is useful for Motorhomers. Close to Utah Beach and St Mere Eglis for WW11 museums. Nice clean Swimming pool. Flat quiet roads in the area for cyclists. My Wife and I have been to this site 5 times now each time we arrive we are greeted with friendliness,we are always given a choice of pitches which are roomy with tidy short grass.The pools are wonderful,the shop always has fresh bread. We just love this camping site. Volete prenotare il campeggio Campeggio Le Cormoran o oppure saperne di più? Potete farlo usando i seguenti dati oppure tramite il sito del campeggio. N13 Caen-Cherbourg uscita St. Mère-Église. Da St. Mère-Église D15 in direzione Ravenoville, quindi in direzione Plage. Il campeggio è segnalato. 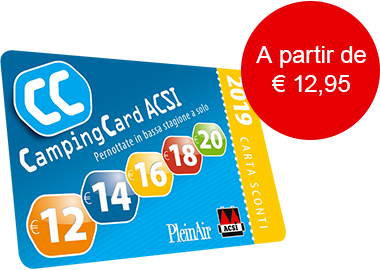 ACSI Eurocampings invia la tua richiesta di informazioni al "Campeggio Le Cormoran".